Kalhora temple (masjid), Pacco Qillo, Hyderabad, Sindh. The 'Kalhoro/Kalhora' (Sindhi: 'ڪلهوڙو/ڪلهوڙا') is a Sindhi tribe of Arabic origin are the descendants of Hazrat Abbas ibn Abd al-Muttalib (رضي الله عنه) Paternal Uncle and Sahabi (Companion) of Islamic Prophet Muhammed محمدﷺ. The Kalhora Dynasty (ڪلهوڙا راڄ) ruled Sindh and some parts of the Punjab of Modern Pakistan for over a century (1701 - 1783)CE (100 Years Approximately). The Era of Kalhora dynasty is known as - Golden Times for Sindh. Many prominent personalities of Sindh born and flourished in this era, Poet of Sindh Shah Abdul Latif Bhittai famous for his Shah Jo Risalo (شاھ جو رسالو) is also one of the production of Kalhora dynasty. Khudabad Kalhora masjid (temple), interior view. Khudabad Kalhora masjid (temple), interior view, art. The Abbasi Leader Al-Qaim Abbasi descendant of Abbasid caliph of Cairo Al-Mustansir II arrived in 1366 CE in Sindh to enforce the law of the Caliphate and to work with the rulers of the local tribe. In 1370 CE Ahmed also arrived in Sindh to assist his brother. Al-Ahmed Abbasi married with the daughter of Rai King Dohrang Sahta, and received one third of Sindh Province in dowry. Fathu'llah Khan Abbasi great great grandson of Al-Ahmed Abbasi, conquer the territory Dallu of Alor and Bhamanabad from Bhangar. and renamed the territory to Qahir Bela. 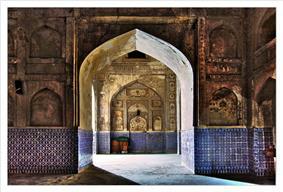 In 1583, Fathu'llah's son, Chenai Khan Abbasi, entered in imperial services as a panch hazari in the Mughal forces. Chenai Khan Abbasi was a pious saint, famous for his bravery and a leader of Panch Hazari in the Mughal Dynasty which was the highest Military grade in Mughal Dynasty. Chenai Khan had two sons Mehdi Khan Abbasi and Daud Khan Abbasi. After the death of Chenai Khan, Mehdi Khan was honored with father's sword and leadership of the tribe and Daud Khan inherited his father's spiritual legacy: the Mussallah (the place of worship), the Tasbeeh (the sacred chants) and the role of Murshid (The Spiritual Leader). Mehdi Khan died shortly after his Father's death, Ibrahim Khan, succeeded his father Mehdi Khan. However, Ibrahim Khan abdicated his role in order to pursue a simple spiritual life at Mount Kalho (ڪلهو), near Hyderabad. Thus then he become famous as Kalhoro Khan (ڪلهوڙو خان), meaning (one who lives a spiritual life alone) and later his descendants use Kalhoro as their Surname. The Kalhora are the descendants of Mehdi Khan Abbasi, and the Daudpota are the descendants of Daud Khan Abbasi. Mian Adam Shah Kalhoro, (Urdu: ميان ٱدم شاھ کلھوڑو‎), the ninth descendant of Chenai, was born in a small village. He rose to prominence through the patronage of Wadera Khabar Abro of Dabah village. The small village of his birth became a centre of Islamic spiritual learning. After travelling widely, Adam Shah Kalhoro settled in Hatri, Chandukah taluk (now a rural union council of Hyderabad). 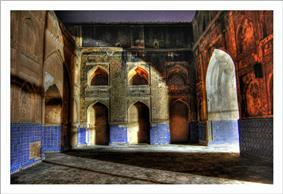 In 1591, Abdul Rahim Khan-I-Khana took the rule of Multan. He moved his forces south into Sindh to attack the Turkhans and their supporters, the Safavids of Iran and the Portuguese. Abdul Rahim Khan-e-Khanan helped a commander of Akbar to take Sindh from Mirza Jani Beg Turkhan. 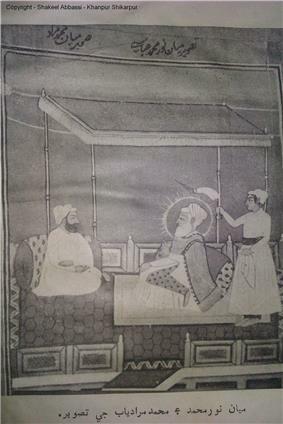 Mirza Abdul Rahim Khan-e-Khánán, the Nawib (a princely ruler), visited Adam Shah Kalhora to ask for his blessing, pay his respects and offer him the zamindar or parguna (an area of land) of Chándúkah, as a jagir (a feudal life estate), for support in the military campaign.Later, his blessings was accepted and Khan-e-Khánán came back victorious from the Battle. Adam Shah Kalhora later went to Multan to Makhdoom Lal Esan Qureshi, a celebrated living saint of the time and a descendant of Sheikh Baháuddín Zakariya Multani. These events had the effect of consolidating Adam Shah Kalhora's influence in north-west Sindh. However, his travels through the lands of the local rulers and the presence of his large entourage caused discord and Adam Shah Kalhora was killed. He became a martyr among the Kalhora people. Adam Shah Kalhora has followers in a number of tribes including: the Abro, Bhatti, Jokhiyo, Junejo, Sial, Sahta, Rajputs, Kalwar, Jatoi, Khosa, Chandio, Leghari and, Talpurs. Adam Shah Kalhora founded the Mianwal movement. He had two sons: Daud Kalhora and Ibrahim Kalhora. The Kotwal (chief of police) and his supporters selected Daud Kalhora as their new leader. Daud Kalhora extended his power and authorities in Hatri village near Larkana. He had two sons, Ilyas and Ali (Shahal). Ilyas increased holdings of land and disciple numbers. In 1620, he died in Mujawar village, Dokri taluk, Larkana District. After Ilyas' death the disciples elected Shahal Kalhora their new spiritual guide and governor of the area. Shahul Kalhora held the lands of the Abro and Sangi tribes until his death in an attack by the ruler of Bakhri in 1657 CE. Noor and Muradyad. The image is rare as portraits were contrary to the Sufi religion. 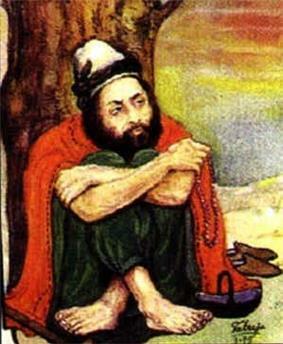 Shah Abdul Latif Bhittai شاه عبدالطيف ڀٽائي Bhittai was a poet of the time of the Kalhora dynasty. Genealogy of the Abbasi of Sindh. Genealogy of the Abbasi clan. Sketch of the Pacco Qillo built by Ghulam Kalhoro. Drawn by Lieutenant Edwards (c. 1845). The Pacco Qillo, Hyderabad, is in much need of repair. The Kalhora ruled Sindh (now a Sindh province of Pakistan) between 1701 and 1782 CE. 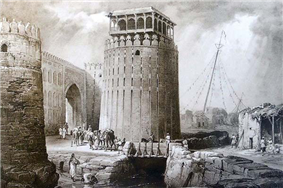 From 1701 to 1736 CE the centre of power was Khudabad, and from 1768 - 1782 CE Hyderabad, Sindh. The official and court language was Persian and Sindhi was language of the people. The first ruler of the Kalhora dynasty was Nasir Kalhoro (1657-1692). Nasir, a pious and virtuous man, was harassed by the Mughals of Bakhir, (north Sindh). He spent much of his time in the sand desert near Shahdadkot, Punjab. Eventually, he established his settlement on the plains of Kachho (an area in Sindh). He battled Mirza Pini, governor of the Siwi and the Panwhars and in a settlement truce, was exiled to Gwalior by the Mughal emperor Aurangzeb Alamgir. Fighting continuing, until Nasir escaped with the help of Bahadur Daudpota of Shikapur. Nasir returned to lead the Mianwal movement and defeat the Mughals. 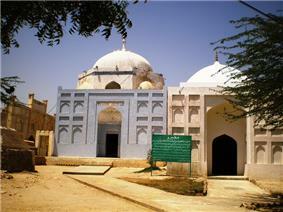 Nasir died in 1692 CE and was buried in Gaarhi near Kakar taluk, Khairpur district, Dadu, Sindh. His tomb was built by his son, Yar, in 1708 CE. In 1692, Nasir Kalhora was succeeded by his elder son, Deen (Din) Kalhora who fought against Mughals to consolidate his power. Deen continued to lead the Mainwal movement, becoming strong politically and increasing land holdings. In 1695 CE, Muiz ul-Din, the eldest son of Muazam Shah Alam, was appointed as Governor of Multan by his grandfather, the emperor Aurangzeb Alamgir. The Mughals accused the Kalhora of making trouble and Muiz ul-din and the governors of Bakhar Sarkar and Siwistan Sarkar objected to the Mianwal movement. A series of attacks on the dairas (holdings) of the Mianwal leaders failed, leading to the battle of Garello township, Dokri taluk, Larkana district in 1699 CE. In this battle Feroze Faqir Virar (a disciple of Nasir Kalhora and a general of Deen Kalhora’s army) led the Kalhora forces who included men from Gaarhi, Kakar, Khairpur. Jehan led the Mughal forces, assisted by the Panhwar. The Kalhora persisted and Jehan died. In 1701 CE, Muiz ul-din retaliated, marching from Lahore to Sindh. Deen Kalhora sent his brother, Muhammad Kalhora, and two advisors, Qasim and Khaman, to Bakhar, to appease Muiz ul-din. The men appeared before the prince and convinced him to return to Lahore. Muiz ul-din was on his way to Lahore when he heard news of looting and ransacking of villages by the Mianwal. He returned and a fierce battle was fought on the banks of Nai Gaj river, Dadu District. On his defeat, Deen Kalhora asked for clemency but was killed and buried in Sindh. After Deen Kalhora's death in 1701, Yar Kalhora, a younger son of Nasir Kalhora, took refuge with his followers at Kalat. There, he was rejected by the Baloch and lived in the Kirthar Mountains where the Mian Gun peak is named for him. Eventually, he returned to Sindh and the prince, Auranzeb honoured him with the title Khudayar Khan. In 1736, the Mughal Emperor, Muhammad Shah, affirmed the next ruler of the Kalhora dynasty, Noor Kalhora, by naming him the Kalhora Nawab of Sindh. The latter later became, in the late 1740's, subordinate to the Afghan Durranis, who incorporated Sindh. A necropolis (1753), named for Noor Kalhora, is located 15 km east of Dalautpur town, Nawabshah district. In 1782, the Talpur Baloch fought against the Kalhora. The Talpur Baloch defeated the Kalhora ruler at the Battle of Halani. At the end of rule of the Kalhora dynasty, the Kalhora settled in Khanpur, Shikarpur. The Kalhora dynasty left to Sindh province a legacy of arts, science and a system of benign taxation. For example, an irrigation system of several wah (channels) was completed. The great Kalhora clan took their expertise to the plains of Lahore for a showdown with the Haroon clan and the Jamis. Mian Muhammad Muradyab Khan Kalhoro, nawab of Sabuland. Sardar Ali Murad Khan Kalhoro, 1880 - 1925. Sardar Ali Nawaz Khan Kalhoro, 1925 - 1970. Sardar Haji Khan Kalhoro 1970 - 2006. Ashraf Abbasi, deputy speaker of the national assembly of Pakistan. Munawar Ali Abbasi, MPA - PPP. Ahmed Ali Kalhoro- Honorable Mention and son of Ali Ahmed Shah, grandson of Hamza Hussain Shah. Hammad Ali Kalhoro- Gained the title of 'Teeko' after being martyred in a battle for his manhood with the Rangoonwalas, and outperformed his elder brother Ahmed Ali and father Ahmed Ali Shah at LUMUN XI. Daudpoto A. History of Daudpota (Urdu: الطاف حسین داؤد پوٹو‎). 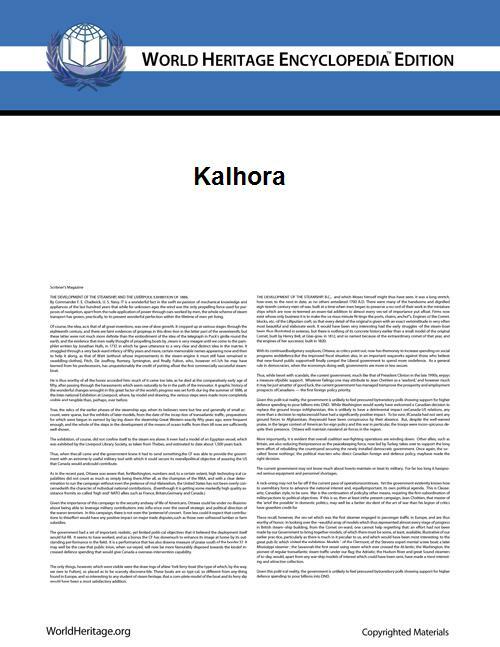 History of the Kalhora's Panhwar.com website. Fall of the Kalhora's Panhwar.com website. Mahar G. W. "Tareekh-e-Sindh, Kalhora Daur." Volume 6, parts 1 and 2. Shijra Aliazlan at Google Pages website. ^ Fredunbeg M. K. (1853 - 1929) "History of Sind - translated from Persian books." Karachi 1902. ^ a b "Kalhora dynasty, domes and debris." Dawn.com website 3 March 2012. Accessed 14 March 2014.